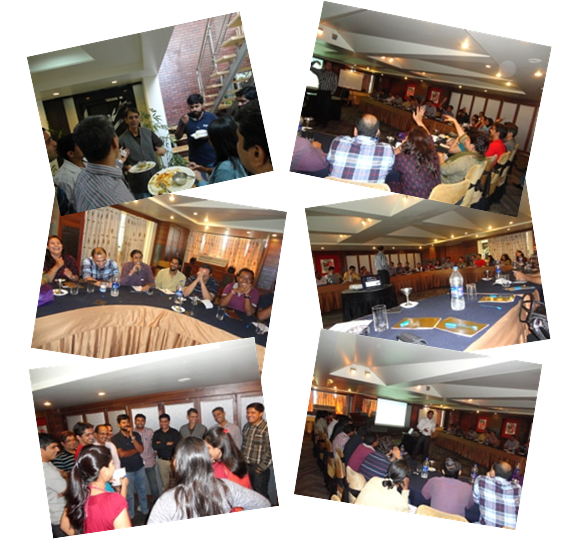 We conducted a paid workshop recently in Pune called “Design your financial life” . The idea was to take participants beyond financial products and involve them in the thinking process. It was a fun filled day with lot of participation and some really good money conversations which made people really think about their financial lives and how they are leading it till now. Here are some snaps and video testimonials of participants. The next event is scheduled in Bangalore on 13th May 2012 (Sunday). The seats are limited and there is a Rs 200 discount for the first 10 people who will apply the discount coupon ACTIONTAKER . They will save Rs 200 on the ticket. It will be a full day event from 9 am to 6 pm at Shilton Royale , 9, 100 Feet Road, | Koramangala, Bangalore 560 047 (Near Sony World). The resigtrations are based on first come first serve basis and it will close by 10th May 2012 . We really want to make this workshop a readers event and we want couples to come together so that they can jointly spend a full day in this workshop. Any other workshop coming up in bangalore??? We might come up very soon with a workshop in Bangalore ! , mostly in June/July ! Good to see that .. I am it will be a worthwhile investment for you ! Looking forward to it excitingly. Welcome .. I am sure you will get a great value out of the workshop ! Waiting for this workshop in at Kolkata & Siliguri. We are not planing it around Kolkata . Is there a seat limit for this? I am not sure if I will be in India on 13th May, so cannot register now. But if I am in India, I wouldn’t want to miss this event! We have a limit of total 50 people and half of it is booked at the moment .. You can register whenever you are sure you will be in Bangalore .. Thanks. I will definitely not be in Bangalore, but if in India, I will travel to Bangalore for this. Nice to know it. Registered the moment i noticed it! Seriously looking forward to learn the values and apply them in daily life. Great to see that Sushil .. look forward to meet you ! Will not be there in Bangalore to be a part of the workshop. Dont worry .. you can attend a chennai workshop or some other time in bangalore ! Sure .. I am confident it will be very helpful to you ! Are you planning to have this in Chennai? At 30 , after enough financial mess i made , i took my first step .I just got my jago inv book from fliPkart this even . My thanks and best wishes to the team . You may consider having a tie-up with superseva. It is an organisation who offer services including selling tickets of various events across the Bangalore city, to employees of various companies. They can be reached at 080-49051666. Thanks Vivek .. let me have a look at it .. I think as of now ayojak serves our purpose ! I am in as well.. just purchased the ticket..hopefully turns out to be a worthwile investment ! Awesome. Nothing happens outside of your intention…Set your intention clear on why you are participating and what you would like to create and you will get that. From now till the workshop date keep thinking what needs to be done to live an amazing financial life….because that is what we are going to discuss during the event. Will both of you be there in the event ? Iam from Bangalore and really interested to join the sessions… Would you be able to give us hint / trailer on what all you would covering during the day ? I want to opt for the Husband/wife ticket but we have 2 young kids, it would be difficult to make an arrangements to leave them some where and come for the workshop, (not sure if it is crazy to ask) are there any children play areas in the Shilton hotel so that we can bring the kids along and leave them in the play areas ? Let me check with That hotel on this and will get back to you . Its a Sunday , wont you be able to leave your kids at some friends place ? For a day ? I am in, purchased ticket. Hope this investment to understand investments will be fruit-full. I have few expectations from this workshop , the imp one is Financial freedom(passive income,etc.). Waiting for this workshop in Jaipur. Would you like to take some leadership in this area so that jaipur event happens at the earliest. Would you like to get on call with us and discuss how you can make it possible….I am sure if we put some efforts we can have program in any city that we want. Pingback: What is your Money Story? Awesome. Great to have you in the program. We look forward to meet you and priya.